In TBS' "People of Earth," Ken Hall plays the middle-management alien Jeff the Grey. Now in its second season, the 30-minute TBS show "People of Earth" has proved that it's more than a quirky comedy built on an absurd premise: a reporter investigating a support group for alien abductees (though they prefer the term "experiencers"). While every episode is jam-packed with jokes, double entendres and physical foibles, there's also a surprising amount of complex character development, heart and humanity in the portrayal of both the "StarCrossed" alien experiencers and the aliens themselves. The most charming part about the aliens in "People of Earth" is how human they are. 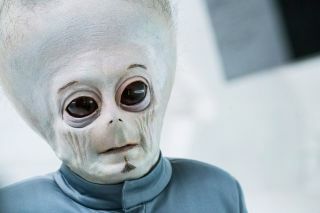 Ken Hall, an actor and comedian who plays the sometimes brusque, sometimes bashful, but always lovable gray alien named "Jeff," talked to Space.com about the latest season of the show and why "People of Earth" has developed such a quick cult following. Actor and comedian Ken Hall plays the alien Jeff in TBS' "People of Earth." Space.com: When you first signed on to do "People of Earth," did you think it would be a goofy comedy about aliens and abductees? Or did it already seem deeper than that? Ken Hall: I got a pretty good indication right away because of the script that we used for the audition. As soon as I started reading it, it was just really smart, and funny and kind of quirky as well, because it's this alien, but he's just working this job, just like a regular human would be. Greg Daniels, who is one of the executive producers of the show, was actually at the callback, and [as I was] talking with him about the vision for the show, he enforced very early on that these are real people — that even the aliens, we don't want them to be too alien-y or this creepy stereotypical kind of thing. More like we want them to feel like real people, to talk like real people and to have real people feelings. And that's a really cool concept and, I think, part of what makes the show so unique and gives it so much heart. Because even though we're aliens, we're still very relatable, and we're all just trying to find the connection — not just on the ship, but in the galaxy, in the universe — and have an understanding of how we fit into the world. Space.com: As an actor, when you think about Jeff, do you even think of him as an alien, or do you just imagine him as this guy in a workplace who's trying to get through the day? Ken Hall wears a prosthetic head to portray Jeff the Grey in "People of Earth." Space.com: Speaking of the prosthetic, how does the internal part of the head work to project your facial expressions? How much of it is CGI [computer-generated imagery], and how much of it is you controlling it? Hall: It's actually me. The only CGI thing that happens in terms of the prosthetic is the blinks; as far as I know, that's the only thing they put in, in post [production]. The costume is broken into three parts. It's sort of like a giant helmet hat thing that I pull over my head, and then my face is exposed. But then there's one major part that gets glued on top, and they glue on my nose — and then there's a chin that they glue on as well. So, my entire face is covered — my entire head is covered, actually — but it's just a really excellent design. The prosthetic really allows for the expressions to come in. It was kind of a question mark coming in — how expressive the prosthetic would really be — but I'm glad it's something that allows me to emote and show expressions. Space.com: I was curious about your take on this, for the fans: How old do you think Jeff is, and what do you think his job title is? Hall: I see him sort of as the alien equivalen[t] of maybe his early 30s, perhaps. Because I feel [that's about right] to be in his position, which is probably sort of a mid-manager, even though he probably sees himself as the head manager or supervisor of the ship/branch; maybe he's a branch manager. Space.com: What are some reactions you've gotten from fans about how they feel about Jeff as an alien/guy and about the show in general? Hall: You know, it's really something. The reaction that I've gotten from people has been incredibly humbling. I think they see a lot of themselves in Jeff, in his frustration; I think they empathize with him as well. And when things kind of go off the rails, like in the first season, I think he really shows his frustration and emotions. But he's also trying to do a good job, and he wants to be happy like everyone else. I think people feel like they understand Jeff. A few weeks ago, I was at Comic-Con, and it was really cool to talk to the public, to talk to the fans and to hear from them about the show. The coolest thing for me is to make the audience laugh and to feel something, and I feel like with Jeff, that's really happening. And I love that, and it feels so good for me to be on the receiving end of a very genuine fan base cheering you on. It's like, wow, you really love the show. In fact, someone sent me a picture of a tattoo of Jeff's head on their arm and then under that, a reindeer, and then under that, the words "Don't get weird" — and I thought it was so wonderful and beautiful. Another person on Instagram messaged me the other day who had a Jeff-ish alien tattooed behind her ear, and I love it. It's great, and the second I saw the script and read it, I was immediately like, "Yeah, I can picture this." Space.com: This season saw a lot of changes, and I think because of everyone's love for Jeff, the changes on the ship really stand out. Eric the Cube, the ship’s new supervisor who is a literal floating cube, and reminds me a lot of HAL from "2001: A Space Odyssey," is strange because he immediately makes some comments about Jeff being incompetent and seems to make some slights about him being a gray [alien]. What's that about? Can you give fans any insider info on why Eric likes Don and even Jerry, but just immediately dislikes Jeff? Hall: Yeah, it's a good question, and I don't know. Maybe it's just one of those things where it's a personality clash. Maybe there's more behind it as well. Maybe it's a game or a status thing. Maybe they feel so threatened by each other. I think it seems like more of a personality thing, but who knows; there could be more behind that. We don't know yet; we'll have to just see how things go. Space.com: I don't know how many tidbits you can give me on this question. I think the whole relationship between Jeff and Kurt is so sweet, and in the most recent episode, we learn that Kurt is still alive. The way the story is framed, it seems as if he had been brought back to life, perhaps by true love's kiss? Any comments on that? Hall: Well, that's such a lovely sentiment, right? The whole idea of real true love. So again, it's a bit of a question mark on that, but maybe it's up to the fans to figure it out or for them to choose how they feel. Space.com: Will we learn more about Kurt and Jeff and their relationship as the season progresses? Hall: Yes, definitely. We're going to find out more about their relationship and their dynamic. I think what's interesting with Kurt coming back is, how does that affect the dynamics on the ship, and such. Jeff's had a really hard time thus far without having that one person who really gets him, and now Jeff has more of an ally again. It really offsets the balance of Eric the Cube and Don and Jonathan and Nancy; it's very interesting. I'm really excited to see how all of this unfolds. "People of Earth" is about the unifying things that make us human, even if we're aliens. Tune in to watch it on TBS every Monday at 1:30 p.m. This interview was edited lightly for length and clarity.